Once upon a time, people assumed big vehicles were safer in crashes and wrecks, simply because of size. We’ve since learned that’s not the case at all, at least in terms of occupant safety. A big pickup truck might have less damage in a fender bender with a small hatchback, but unibody designs and crumple zones determine how much of that impact is actually felt inside the passenger compartment. 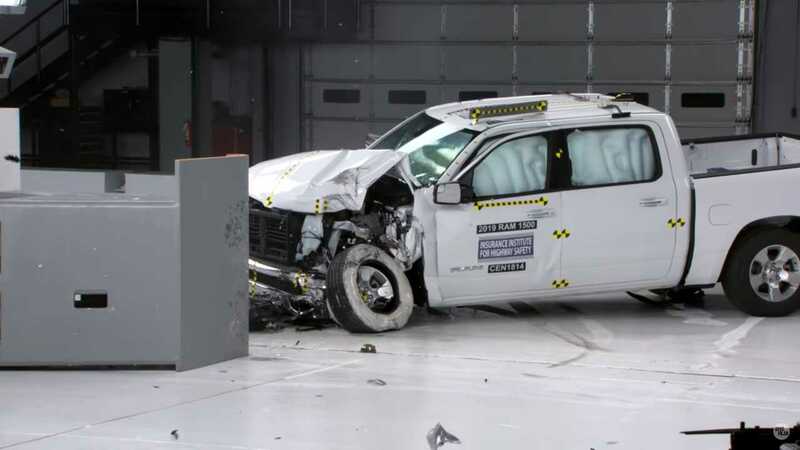 Ram engineers have been working hard in that department, and it shows – literally – in this new crash test video from the Insurance Institute for Highway Safety on the 2019 Ram 1500. The redesigned pickup received good ratings in all IIHS crash tests, improving from the previous-generation Ram which only managed marginal ratings for roof strength and driver-side front overlap, which is the collision featured in the above video. Passenger side front overlap tests weren’t required on earlier models, but for 2019 the new Ram ranked good there as well. When equipped with the optional collision avoidance system – a feature offered on the Ram for the first time this year – its head-on crash prevention rating climbs to superior. Watching the video, it becomes very clear how crumple zones in a vehicle work to absorb the energy from a collision. Overlap collision ratings are especially critical because it basically omits half of those zones, sending the full force of the crash through one area. It’s fascinating to see how energy from the impact dissipates through the entire truck on the outside, literally tearing the front clip of the driver’s side to shreds. When the camera switches inside, however, there’s very little intrusion into the passenger compartment. That's a very good thing. Unfortunately, IIHS doesn’t rank the 2019 Ram 1500 as a Top Safety Pick. The new headlights on the truck’s handsome front redesign apparently aren’t up to snuff, as they only garnered a marginal rating. Still, it’s a definite improvement overall from the previous generation.